This is the story of where the Rubber meets the Board....I happen to call the tippy board a "Teeter", but I don't object if anyone else wants to call it a See-Saw. 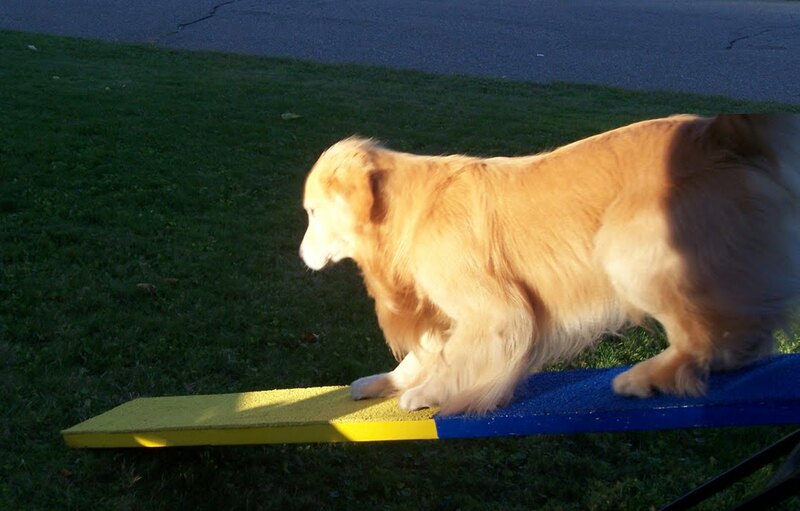 I'm reasonably sure that if I had to say See-Saw ten times fast it'd come out something like She-Shaw, so I'll ummmm. Stick to "Teeter". Plus I can use word-play and call Teller "Teeter-Woo". When we started seeing rubber contact equipment Teller had a bit of a crisis of confidence...rubber teeters feel weird, Teller has sensitive feeties, etc. So it was time for Operation Teller's Rubber Teeter... It started off as just a new teeter board for the rubber skin (from Rubber on the Run via Max200), then I decided to replace my existing sand board too since it was now three years old and was showing a lot of wear and tear from it's three Vermont winters spent outside in the elements. Happily, I discovered that I can fit a 2x12x12 in my van and close the hatch behind it (yay), I also discovered that Lowe's employees are entirely useless as 5 different lumberyard employees watch me sort through the stack of 2x12x12 boards for one that wasn't warped, didn't have a structural crack or huge knots near the pivot point. They then watched me load the board onto the cart and enjoyed a cigarette (three of the five) on break out in front of the store helping a contractor load four 2x4x8's into his truck while I loaded the board into my van. I never thought I'd praise the buffoons at Home Depot, but when I bought a second plank I had two Home Depot employees who traipsed across the parking lot to load the board for me. Lowes FAIL. Off to Aubuchon for primer - my brand of choice is KilZ and some latex outdoor paint - Here's step one primed and first coat of yellow contact. 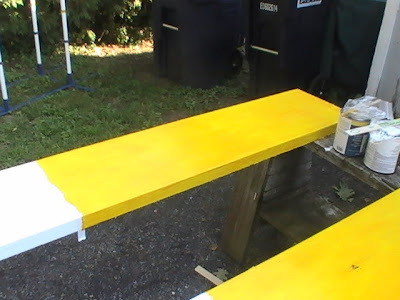 The quart of paint was called "Canary" but at this point I was pretty sure I had just painted my teeter "French's Yellow Mustard". Pass the relish. I finished painting both boards using "True Blue" for the solid contact color. I finished one board with sand - a 50-50 mixture of pool filter sand (coarse) and beach sand (fine) - I just happen to have both hanging around - random eh? There are a few different methods for sanding contact equipment, my favorite (and what has worked well and held up the longest) is to apply two clean (no sand) coats of paint over both sides of the board - letting each coat cure according to can instructions and weather. 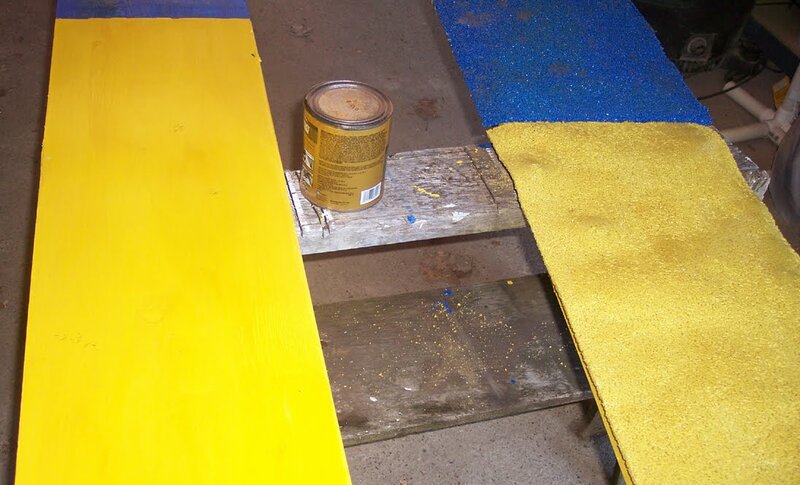 Apply a third coat of paint over entire board (yellow, blue, yellow) then liberally apply sand mixture over wet paint. 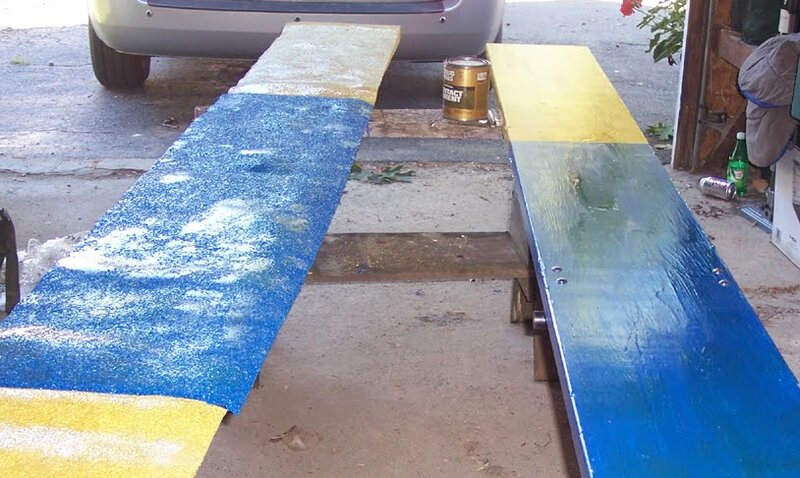 Using a gloved hand (or not - paint washes off) rub sand into paint, then pour a bit more paint onto the board and work into surface sand - in small circles until paint and sand are well incorporated. Work with a disposable brush if you'd like - brush off excess, then let dry and you should be good to go! Now back to the rubber plank...Darlene from Rubber on the Run recommends DAP Weldwood contact cement. Contact cement is a funny thing - it smells like the rubber cement that I used to play with in elementary school - but the fumes can be overwhelming. I worked in my garage but had all three doors open with a fan running to provide some additional ventilation. Contact Cement applied to both sides - Finished surface on the left and the rubber skin upside down on the top of my sand plank (right). Application of contact cement - before you start this process you need to have help lined up about an hour into the process. This isn't optional - I had planned to do this myself, but I'm so relieved to have had the foresight to make arrangements for another set of hands. 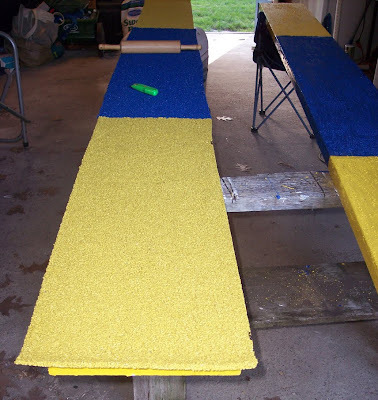 Apply one coat of contact cement to each side and let the cement dry (20-30 minutes). I found that the rubber surface really adsorbed the contact cement - I did get a little nervous when I saw the skins ripple and bubble between the first and second coats. Here we are (above) after the second application of contact cement. You can see that the previously flat skin (left) is now a bit rippled and wavy. The finished plank (also with a second coat of cement) looks shiny. And we're stuck! Rubber is applied, rolling pin to ensure adhesion. Lots of trimming still to do. You can see a bit of the texture of my sand teeter plank in this picture - I have a relatively grippy surface on the sand plank thanks to the addition of pool sand in the texture application. The rubber has met the board. The process we used to apply the rubber started with the blue piece of skin - get the edge lined up on the contact edge. One person worked with lining up the skin, while the other held all but two inches of skin up over the board. Once the two sides of contact cement meet, any adjustment is impossible. TAKE YOUR TIME ON THIS STEP!!! The yellow skins were much easier to install as there was less material to work with. We used the same method, one person setting the yellow edge to the blue edge and the other holding the rest of the skin, feeding the skin along the board taking care to go straight. Trimmed and mounted on the base....Sort of a weird teeter angle here isn't it? So, Mr. Teller-Woo, what do you think of your new rubber teeter board? A freshly bathed Teller-Woo shows off his contact behavior. Addendum: I know that there are other widely accepted methods for applying rubber to contact equipment. Lori from Waggles had a great result rubberizing her dog-walk using the wet-pour method, I wasn't around for the in-progress steps so I can't compare the ease of application relative to the two processes. The wet pour method is essentially bags of black rubber pieces that you mix with paint and apply directly to the surface. With this method the existing contact slats are re-used and the rubber simply formed over them. For some reason I'm picturing this massive paper mache project!! The Rubber on the Run folks also have a kit, where you essentially make your own skin on a plastic pattern and then apply the skin to the obstacle - when I looked at what went into making my own teeter skin (and the materials required) I bagged out on any perceived cost savings of making my own skin and called Irene from Max 200 to see what they had in stock for skins. I understand that there is currently a back-log on the custom skins when I checked with a couple of vendors** I was told that new orders from a couple of sources will ship in January (egaads!). There's certainly demand for the product! 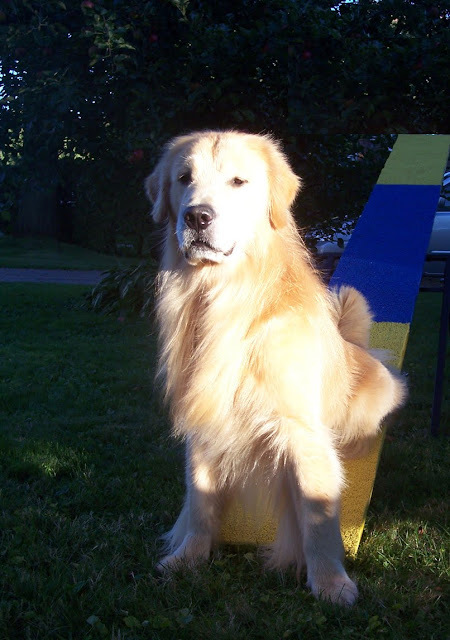 I'd love to get my hands on an a-frame or dog-walk skin from Rubber on the Run just to see what they look like as they have rubber "slats" constructed as part of the skin. I've seen the skins applied on Max200 trial equipment, but I'm interested in the process of creating rubber slats. ** 11/11/2010 - The folks at Max200 have reported that custom skins are now shipping in two weeks. Apparently the back-log has been resolved. I have looked and looked for a tutorial on this. 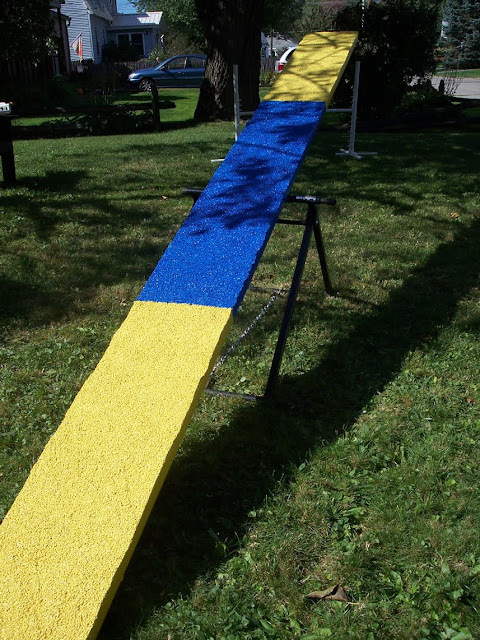 I'm applying a rubber skin on my teeter this weekend. I have posted this to my favorites. Thanks so much!